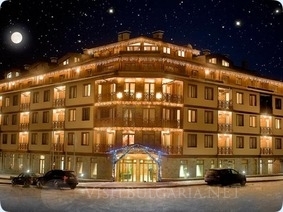 Vihren Palace SPA and SKI hotel in Bansko mountain ski resort in Bulgaria. Vihren Residence aparthotel, Bansko. - 10% discount until 16 November 2018. - 7=5 nights for all arrivals in the period 02 Jan - 01 Apr 2019! The Extras and Early booking discounts could NOT be combined! Location: VIHREN PALACE SKI & SPA RESORT is the newest 4-star hotel complex in Bansko, one of the most famous Bulgarian ski resorts. The complex is uniquely located – only 80 m away from the main ski lift /Gondola/, and just 4 minutes away from the old town center. It offers its guests coziness and high standard services. Accommodation: The hotel provides a great variety of rooms – single and double rooms; apartments - one- and two-bedroom; mezonettes – one and two-bedroom, all offering comfort and home coziness. The rooms and apartments are elegantly furnished with a fully equipped kitchenette, refrigerator, upholstered extending furniture, 26-channel TV sets and wireless Internet. All rooms and apartments boast an unforgettable view over Pirin and Rila Mountain. Child care: The complex offers a special equipped children’s corner, children’s menu, and professional care for children – games and school. Spa & Wellness: VIHREN PALACE SKI & SPA RESORT offers a modern Spa Center with three massage salons, aromatherapy, indoor swimming pool, sauna, steam bath, Jacuzzi and shock swimming pool. The exceptional SPA Center is working only with the best spa cosmetics from the famous brand Darphin and Beauty System with supplements from Dead Sea. The hotel provides an equipped fitness center with a view towards the swimming pool and sunbathing in the garden during the summer. Wine & Dine: The Main Restaurant “Symphony” offers you European and Mediterranean cuisine served excellently in a cozy atmosphere - at the foot of Pirin Mountain with the rippling Glazne River by your side. The thematic nights at the restaurant will take you to various exotic places all over the world. The Unique Tavern “Bulgare” will welcome you to the world of Bulgarian dishes, delicious grill, wines and the magic of Pirin Area. We will make your nights unforgettable with the national folk rhythms and songs sung by talented Bulgarian artists. Aqua Lobby Bar “Aqua” - offers its stylish menu and comfortable atmosphere, which you can enjoy all day long – before or after a tiring skiing down the snowy runs of Pirin Mountain. Coffee Shop “Merci” - offers you sweet things made with love and long-lasting taste, which will make you come back again and again. Night Club “Mirage” - the night club "Mirage" is working from 23:00 until 04:00 in the morning to satisfy all your desires and musical choices. The wide variety of musical choices from the past century will satisfy all your musical and night-life adventure desires.